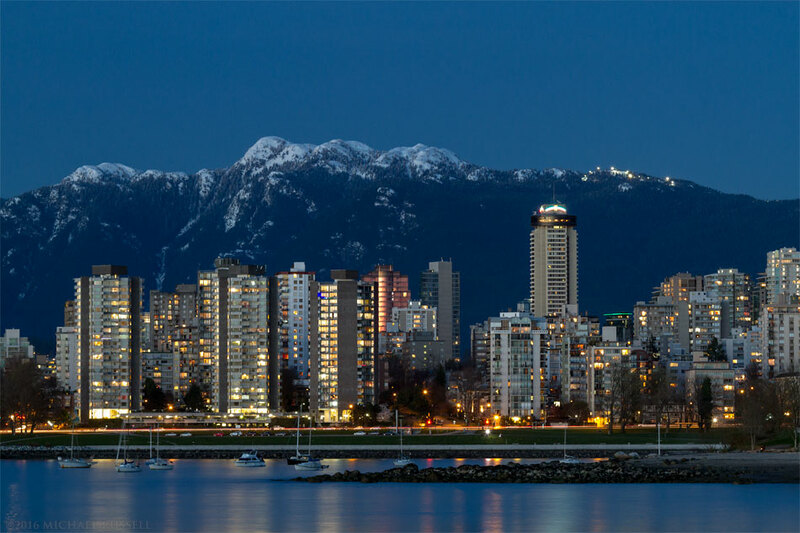 Wide panorama from Vancouver’s Kits Beach including Stanley Park, Crown and Grouse Mountains (left) and Mount Seymour (right), and the West End downtown towers. Last week I posted a photograph of the M.V. Fortune and Crown Mountain that I pointed out was just one portion of a much larger panorama shot from Kits Beach. Above you’ll find my finished panorama a view of the anchored M.V. Fortune, Crown/Grouse Mountains and Stanley Park, and the West End of Vancouver and its apartment and condo towers. The two taller buildings on the right of downtown Vancouver are the new Trump Tower and Living Shangri-La. I made this photograph standing just outside the boundary of Kits Beach Park along the seawall path on the west side of the Kitsilano Yacht Club. I think this photo really exemplifies the name “Vancouver Coast & Mountains” which is the tourism region Vancouver is located in. 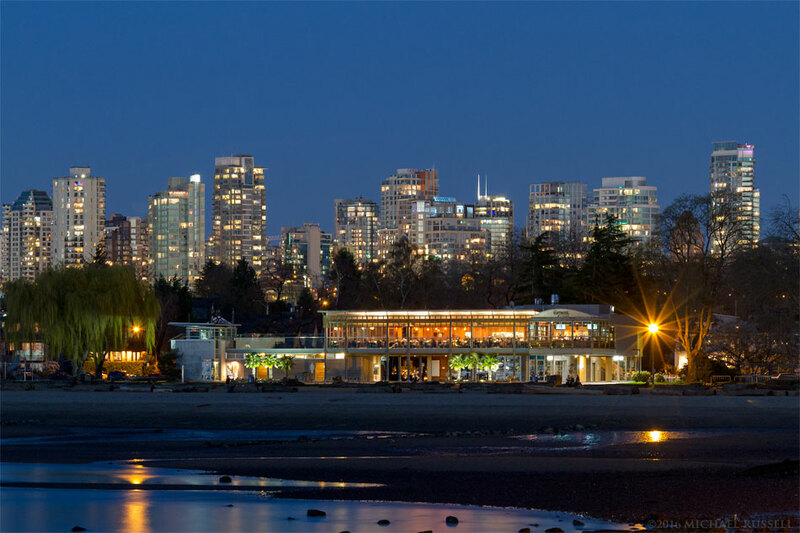 I made a number of panoramas from the Kits Beach area. The one above is similar to the first, but shot from the eastern side of the Kitsilano Yacht Club. I tried to focus on Mount Seymour and the downtown area and included the Kits Beach Boathouse Restaurant in this one. This panorama was made about 15 minutes after the first one so you see many more of the lights on in the city buildings which I prefer over the look of the first panorama. On this evening I was out to photograph the city with snowy mountains in the background, so I made some single exposures that focused on just these subjects. This photograph shows Mount Seymour and the towers in the West End. The tallest of the buildings in this photo is the Empire Landmark Hotel. In the foreground we have the lights of vehicle traffic on Beach Avenue and the sandy shore of Sunset Beach. This is the Boathouse Restaurant on Kits Beach photographed after sunset. I like the reflections on English Bay in this scene and the rare opportunity to photograph without a crowd on the beach. For more Cityscapes of Vancouver take a look at my Cities and Buildings Gallery in my Image Library.